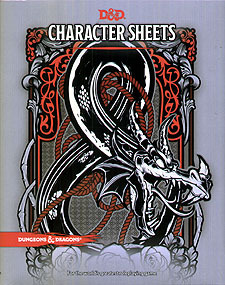 Insider the pockets of this lavishly illustrated protective folder, you'll find a full set of fifth edition D&D character sheets for use with any D&D campaign. Each character sheet provides plenty of room to keep track of everything that makes YOUR characters unique. Three additional styles of double-sided character sheets giving experienced players options based on their individual play preference. Spell sheets for keeping track of your magical repertoire in game. Every character sheet and spell sheet is easy to photocopy, so you'll always have a fresh sheet on hand when you need one.